I use listing sites to generate rental leads – Why do I need a website? It's common knowledge that the majority of renters now search online when apartment hunting- this isn't a new revelation. We've been told over and over how important it is to have an online presence if you want to attract quality prospects. However, how you best utilize that online presence, hasn't been made very clear. With new listing sites popping up what seems like every month, it's very easy to get caught up on spending your advertising dollars here, there and everywhere, in order to feel like you have your listings covered over the vast online landscape. Internet listing sites are great sources for leads, but they don't always paint the whole picture of what you have to offer as a company, a management company and a potential home. 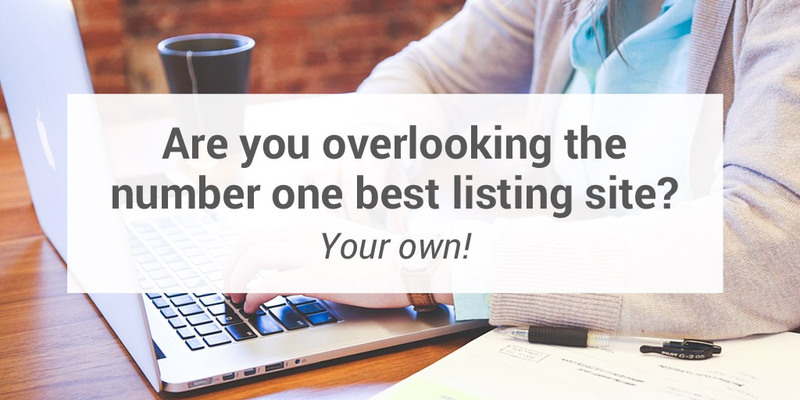 The number one best listing site that gets overlooked time and time again– is your own website. 1. A professional website will help your business gain credibility on and offline. A website is an asset; it is an investment, not a cost. Your website is a reflection of your business- it tells potential renters who you are, your reputation in the community and what your company has to offer. Adding positive reviews or testimonials that have the ability to be constantly updated and archived, will help your potential tenants make an informed decision on whether your company/housing is right for them. Cross-promotion is a valuable marketing concept and strategy, especially online. You can improve your website traffic and online credibility by linking back to your website from any/all listings sites and your social media accounts. Decrease your reliance on listings sites and print media – consider the potential market you can reach with a website. Once a website begins producing leads, it generally continues to do so month after month making it a very cost effective way to promote your properties. Providing information to your customers takes time, whether it's on the phone, face-to-face, or in emails. With a website, you can provide information about your properties and your company which is easily accessible to your customers, saving you valuable time and money. Office hours are often too restrictive to prospects who are working full-time or live out of town. Providing rental information, photo galleries and video tours on your website, allows potential tenants to view your property without leaving the comfort of their current home. We're living in the era of instant gratification and convenience- your prospects will appreciate a management company who embraces technology and allows communication to flow online. By including useful content such as news articles, blog posts or FAQ's, you can keep your tenants up-to-date and informed, at their convenience. Adding a tenant portal or online rent payment capabilities furthers the customer experience. A website is not just a hub for your listings, it's your portfolio. Your website provides renters with the ability to view all your properties in one location, get an idea of the quality of rentals you provide and find the best fit for their next home. Place a spotlight on high-vacancy buildings to help boost the number of viewings online. The more the property is seen, the greater the odds are you'll generate the leads needed to fill your vacancies. 1. Do you have a website? 2. Does your website currently drive at least 40% of all your rental leads? 3. Does your website portray the professional image you want associated with your company? If you answered no to any of these questions, now is the perfect time to act and take the first steps towards investing in a new website. In the words of Benjamin Franklin "If you do tomorrow what you did today, you will get tomorrow what you got today…" Make the move today!